The Stars get ready to run sprints. Photo courtesy of the San Antonio Stars. 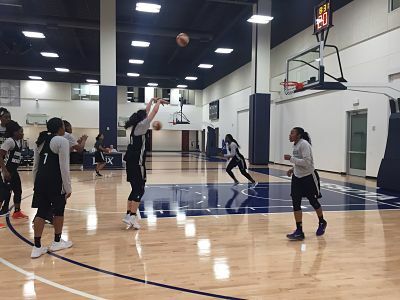 WNBA teams opened training camp Sunday, ten days after the draft. The 2017 season marks the 21st for the league, and two decades since the ball first tipped on June 21, 1997. The defending champion Los Angeles Sparks have 23 players on their tryout roster including Riquna Williams, who didn’t get to suit up last year due to injury; Odyssey Sims, acquired over the winter; veteran Tiffany Jackson-Jones; and several Pac-12 rookies, including draftee Sydney Wiese from Oregon State. The Sparks returning core, Candace Parker, Nneka Ogwumike, Essence Carson and Alana Beard, are still completing overseas play. 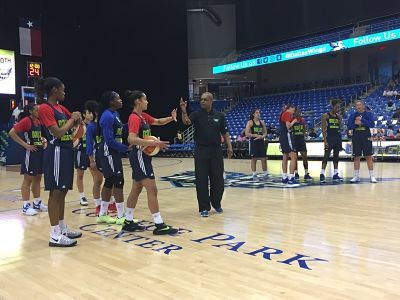 The Minnesota Lynx – last year’s runner up for the title – had a spirited practice that featured most of their longtime veterans, as well as several newcomers. Coach Cheryl Reeve said she liked what she saw. The Lynx run a shooting drill. Photo courtesy of Minnesota Lynx. The Dallas Wings, which had three picks in the draft’s first round, began their second year of training camp with an open practice. Fans cheered on the rookies and veterans as they moved through the two-hour session. The Wings face the San Antonio Stars Saturday in the league’s first preseason game, and Dallas coach Fred Williams was keeping that in mind Sunday. Fred Williams explains a drill in the Dallas Wings’ first day of training camp Sunday. Photo courtesy of Dallas Wings. The Stars featured video of No. 1 draft pick Kelsey Plum and No. 5 pick Nia Coffey on their social media feed. 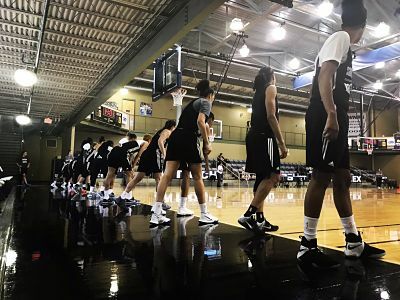 They have 22 on their training camp roster and will have many cuts to make before the first game of the WNBA season May 13. 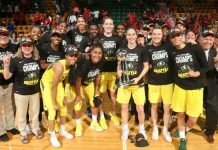 The Seattle Storm finished their 2016 campaign with a winning streak and a playoff appearance, and they began this season with all but two players in camp. 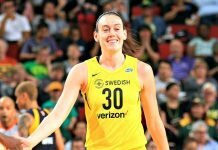 That included back-to-back rookie of the year duo Jewell Loyd and Breanna Stewart, who accounted for almost 48 percent of team scoring and 41 percent of the rebounding last year. Stewart said the team is thrilled to be back. 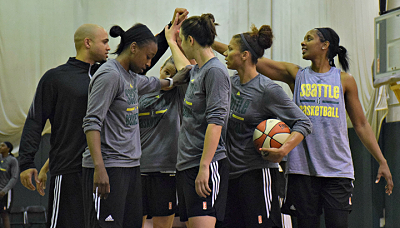 The Seattle Storm huddle up after the completion of the first day of training camp. Photo courtesy of Seattle Storm. The only downer for Seattle was not having point guard Sue Bird on the court. The 16-year-veteran had a knee procedure done earlier this month and is still rehabilitating. 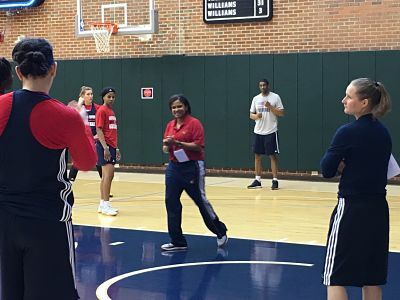 Indiana Fever coach Pokey Chatman pauses during the first day of training camp. Photo courtesy of Indiana Fever. The first training camp to open was Indiana’s, which began first thing in the morning. The teams that didn’t have an inaugural run Sunday were the Phoenix Mercury, the Connecticut Sun and the Washington Mystics. They each begin camp Monday.